I was lucky to be one of about 200 people invited to the Wolf Museum of Exploration + Innovation (MOXI) last Wednesday to welcome, toast, and preview the grand opening of Hotel Californian. The soon-to-be-opened luxury hotel is the newest addition to Santa Barbara’s waterfront and arguably the longest-awaited development in our city’s recent history. Wednesday night’s event featured musical entertainment, local libations, celebrity mingling, and welcoming remarks by the mayor and both the owner and general manager of the hotel. Members of the press were able to walk across the street to view a model room in one building of the hotel, which is still under construction. Our group was led by the hotel owner himself, Michael Rosenfeld. But the real fun started the next day. My colleague Suzanne and I were invited on a personal tour of the hotel and its grounds by Hotel Californian General Manager Carlos Lopes and project manager Tim Krump. We donned hard hats and bright orange vests and spent an hour and a half traipsing up halfway-tiled staircases and through hallways strung with plastic sheeting and caution tape. The hotel will occupy three separate buildings, and our tour took us through all of them. The Californian building is on the southwest corner of State and Mason, in the spot that the original Hotel Californian occupied. The old Hotel Californian was built in 1925 and had its grand opening one week before the infamous earthquake hit. It was repaired and reopened, but it never reclaimed the grandeur that had been anticipated. Instead, after enduring the Great Depression and both World Wars, the hotel fell into disrepair in the 1950s and beyond. Having lived in Santa Barbara since the 1980s, I remember it as the building with Rocky Galenti’s Bar & Restaurant on its ground floor, and I asked Mr. Rosenfeld whether they saved any portion of the old building to use in the new hotel. He smiled and relayed that they were able to save the entire four-story façade. Clearly, the attention to detail that has gone into planning and designing the new hotel has been a labor of love. 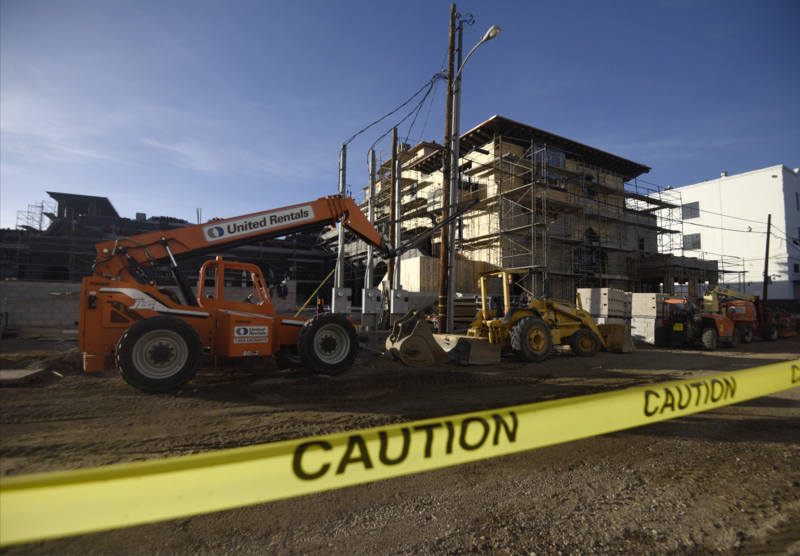 The Californian building will again be four stories tall and contain 62 of the hotel’s 121 guest rooms. The rooftop will hold the pool, a jacuzzi, and an observation deck, while the ground floor will house the spa and state-of-the-art fitness center. We walked through the spa, and with a little imagination got to experience a couple of the treatment rooms and their exquisite tile work. The ceiling of the main room of the spa is a gorgeous, round, deep-blue tile mosaic. The Mason building is on the southeast corner of State and Mason. It is made up of two three-story buildings and will hold 58 guest rooms, plus several meeting rooms. It also contains the main entrance to the hotel and the lobby. Walking through today, one can already feel the grandeur of the lobby area. We visited several guest rooms, each with different color schemes and themes. The bathrooms boast double sinks with marble countertops, barkskin-styled vinyl walls, and beautiful glass shower surrounds, and the closet and cabinet doors are mashrabiya screen patterns. Every guest room has a 65-inch TV, and the in-room bars contain full-size bottles. 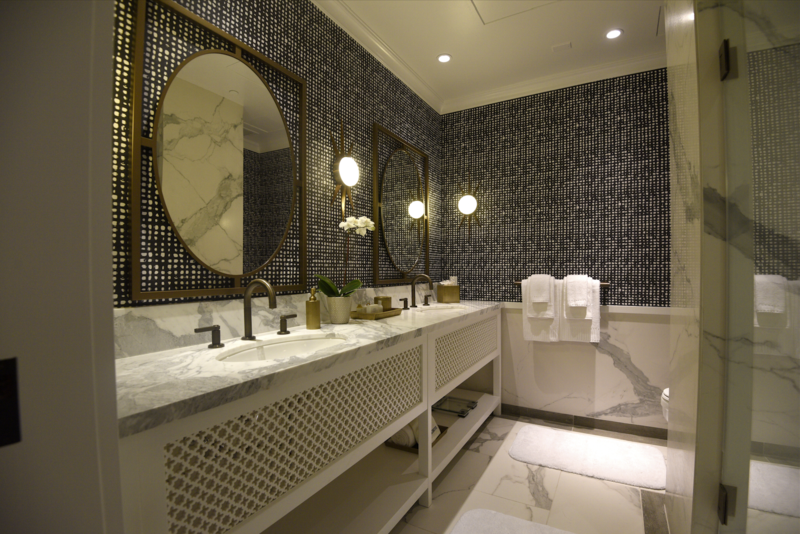 The tile, furnishings, and other touches are the work of renowned interior designer Martyn Lawrence Bullard, who was employed to give the Californian his signature stamp. Most impressive to me is that no two rooms are alike. The State building, on the northeast corner of State and Mason, will surround an open grassy courtyard and a coffee shop, both open to the public. We walked up a wide staircase with a dramatic curved shape, echoing the arched doorways of the ballrooms downstairs, and stood on what will be a rooftop event space with one of the most striking views in town. It’s easy to imagine the ocean-view weddings and other events that will soon take place here. Before we left, we were also able to tour the restaurant on the ground floor of the Mason building. As we toured, Lopes painted a picture of the dishes that will be served, featuring local produce, meats, and wines. The as-yet-to-be-named restaurant is just one of the many facets of the hotel that will both showcase Santa Barbara specialties and be open to the public. Some may argue that we don’t need more bars and restaurants next to the waterfront, but after a peek behind the scenes of our luxurious new neighbor, I’m glad that it will offer grassy paseos, beautiful views, and a friendly place to dine for all of us to enjoy. Hotel Californian will be located at 36 State Street. Construction is on schedule for a planned opening this summer. Room rates will average about $550/night. For further information and inquiries, visit thehotelcalifornian.com.